Tossing out the trash and drinking city-water isn't as simple as it used to be. Most of the complication is for a good reason, to help save money, resources and the environment. 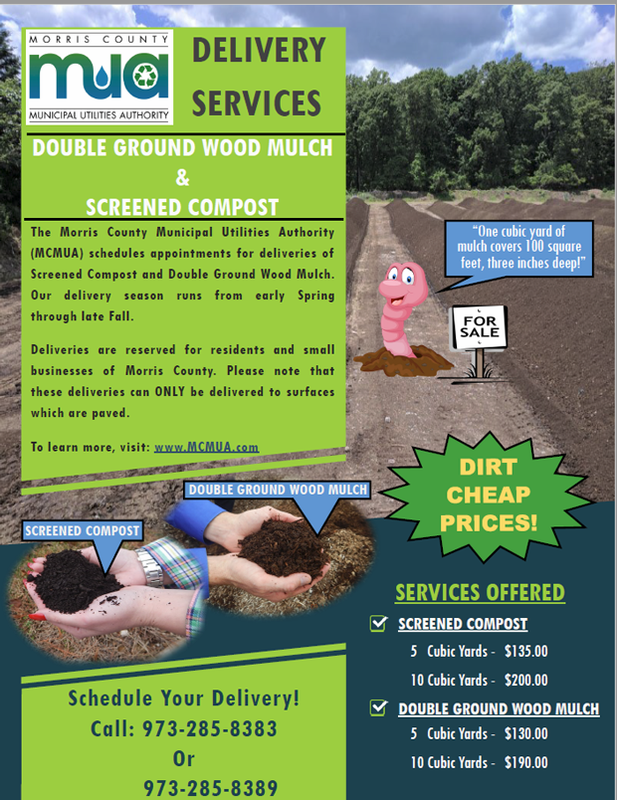 The MCMUA has decades of experience in providing answers to your solid waste and water matters; come find them here. Solutions Every Day! For 2011, the Morris County municipal recycling rate was calculated to be at 47.2%. This is the highest rate in northern NJ, the 3rd highest in the state and places Morris County on track to achieve the 50% recycling rate goal by the 2015 target. Q. How do recyclables get collected in Morris County? Each town in Morris County is responsible for its own recycling collection system, and the level of service provided by each town varies. Many, but not all, towns also provide municipal recycling depots that allow for residential drop-off of recyclables. 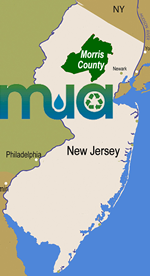 Click here to view the MCMUA's municipal database of municipal solid waste services provided in Morris County. Click here for a listing of municipal recycling depots. There are three primary types of recycling collection in Morris County. Some towns don't provide any recycling collection at all and instead rely on each resident to subscribe and pay individually for recycling collection services with a hauling company that services the town. Regarding apartments and condominiums, some towns provide for the collection of recyclables at the multi-family complexes while others do not. You should check with the manager of the complex to determine how your recyclables are collected. Click here for additional information about recycling at multi-family residential complexes (apartments and condominiums). The company collecting recyclables is sometimes not the same as the entity collecting garbage. For instance, in some towns the MCMUA collects recyclables but does not collect garbage. Regardless of who picks up the recyclables in each town, there is a list of materials that are mandated to be separated from the garbage in order to be recycled. This is known as mandated source separation recycling and it has been the the law throughout all of New Jersey since 1987. While each town is free to devise how to provide recycling collection services, it is the responsibility of each and every resident, business and governmental institution in Morris County to source separate and recycle all of the mandated materials. Click here to read about the list of mandated recyclables. It is not necessary that a town provide collection for each mandated recyclable, and many towns leave certain materials to be recycled independently by the generator. Q. In which towns does the MCMUA collect recyclables? Click here to view the list of municipalities the MCMUA collects from along with their recycling schedules. The MCMUA curbside recycling collection program operates in towns that contract with the MCMUA to perform this service. Typically when a town contracts with the MCMUA to provide residential curbside recycling collection, the MCMUA also delivers recyclables collected at the municipal recycling depot to recycling markets. Depending upon the contract, sometimes apartments and/or condominiums are included in the collection contract and sometimes they are not. Please check with your municipal recycling coordinator or manager of your apartment/condominium to find out who collects both your recyclables and/or garbage. Additionally, the MCMUA's recycling collection contracts with towns sometimes include collection at municipal buildings and/or schools. Q. Does the MCMUA provide household containers for recycling? The MCMUA does not provide recycling containers. The MCMUA does provide recycling and trash decals for your own containers. Click here to view the decals that the MCMUA provides. Q. Should I buy the biggest recycling container available, or is there a weight limit? The MCMUA currently collects recyclables manually, which dictates a 50-pound limit on the the weight of each individual recycling container and its contents. Please use multiple containers if you have over 50 pounds of recyclables to place at the curb for collection by the MCMUA. Q. Should I recycle pizza cartons? A. In most recycling programs, including the MCMUA's single-stream collection program, pizza boxes are acceptable if they are clean and without grease. From our experience, most pizza box tops will be recyclable. The bottom of the pizza box from a plain pizza pie that was delivered with wax paper between the pizza and box is likely to also be clean enough to be acceptable. A pepperoni pizza is likely to have greased up the bottom too much and would make the bottom of the pizza box non-recyclable. The wax paper from the pizza box is not acceptable for recycling and should be placed in the garbage. We wish it was an easy "Yes/No" answer, but it really depends on how much grease gets absorbed in the box and whether someone is willing to tear off the top from the bottom when the bottom is dirty but the top is clean. Q. Are there other materials I am required to recycle besides what is picked up at curbside? While most residents recycle cans and bottles and most types of paper through their curbside recycling program, there are other less traditional items mandated to be recycled, even though they may not be acceptable in the town's curbside recycling collection program. Tires and appliances are common examples of such mandated recyclables. Q. Do I need to label my containers for collection? Residents should label their home garbage and recycling containers. Many people say they know what container is what and they don't need a decal, but the decals are not only for their use but for the curbside collection crew. Some towns have recycling and garbage collection on the same day. Click here to view the decals that are provided by the MCMUA. Q. Any holiday recycling tips? Most gift wrap paper is recyclable and one must not forget about all the corrugated and bottles that are produced during the holidays. Special attention must also be paid to recycling electronics and batteries Click here to view some of the MCMUA's tips on holiday recycling.